Looking for the best dedicated servers in Los Angeles? Look no further than ServerMania’s Los Angeles data center. Our Los Angeles, California data center offers some of the best cross-Pacific network connectivity in North America. Whether you need to hook your services up to China or Japan; South Korea or Singapore, we’ve got you covered. With custom built servers and 15 minute response times, ServerMania is here to meet the needs of any client. Why choose dedicated server hosting in Los Angeles? With servers starting at just $89 per month, our server rental prices are very affordable for the Los Angeles area. Even with such low pricing, we are able to deliver industry leading features. The ServerMania Los Angeles network provides the lowest possible latency to Asia and Australia, making our Los Angeles data center a smart choice for customers who wish to reach those regions. ServerMania’s Los Angeles data center was designed with reliability, performance, and support in mind. Redundant power, network, and security systems ensure that your server remains online at all times. These factors are critical for the best dedicated hosting experience. Our Los Angeles dedicated servers feature a 100% network uptime SLA to deliver a reliable dedicated server hosting experience for your business. These servers are among the best dedicated server hosting options in the United States. 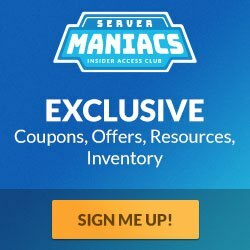 WHY IS SERVERMANIA’S LOS ANGELES DATA CENTER THE PERFECT OPTION? We utilize only the best SuperMicro chassis and superior server hardware to ensure the most reliable dedicated hosting experience possible. A dedicated KVM connection allows you to remotely connect to your dedicated server at any time in the event that SSH becomes inaccessible. There’s no need to contact support for server reboots. Our control panel allows you to instantly reboot your Los Angeles dedicated server at any time. Rest easy knowing that your server’s network connection is rock solid. We offer a 100% network uptime SLA on a fully redundant native 10GE network with connections to nLayer, PCCW, Inteliquent and a variety of local peering. Each server comes standard with 10Gbps of unmetered bandwidth, enough to power just about any project. Test your connection to Los Angeles, California with a speed test.